Without a doubt, Old Louisville is at its most beautiful in springtime. An abundance of pleasant days with clear blue skies, and vibrant colors parading from late March into early May provide a delightful stage to present Old Louisville's magnificent architecture. Crocus, then jonquils, tulips, hyacinths, magnolias, pears and forsythia begin the show. By mid April, the azaleas are in bloom, along with redbud, dogwood, flowering cherry and crabapple. Over half the trees that line our avenues bloom during the first three weeks of April. Late April and early May gives itself over to iris and the first spectacular bloom of roses. Residents usually begin to plant their summer flowers during this time. This time in spring is also the time Louisville celebrates the Kentucky Derby Festival, with hundreds of activities to choose from between mid April and Derby Day, the first Saturday in May. It may be the best time of year to visit Old Louisville. 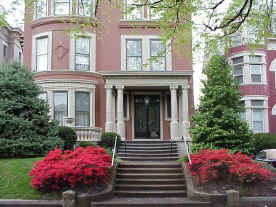 The 1300 Block of Third Street This block of Third Street nearly always has Old Louisville's most colorful Mid-April display, and some if its finest mansions, too! Floral Terrace One of Old Louisville's hidden treasures. The residents make it live up to its name. OldLouisville.com wishes to thankfully acknowledge the contribution of our neighbor Tim Woodruff of Third Street for sending us many of the pictures in this series.